St Louis Pump Distributor | Claypool Pump & Machinery Co., Inc.
A leading pump distributor in St Louis, Missouri, Claypool Pump & Machinery carries pumps for every almost need and application. The premier St Louis pump distributor in Missouri, Claypool Pump & Machinery offers a full line of industrial pump manufacturer sales from the world’s biggest names in pump manufacturing. Call us for with your questions, unique needs, or for pump sales. These high-quality engineered pumps are often used in commercial, industrial, and fire protection installations around the world as well as for oil/gas, marine, and water treatment purposes. Pentair’s North Aurora has received an ISO 9001 Certification for complying with the requirements of Quality Management System in pump manufacturing systems. Count on Claypool Pump & Machinery for a great help to buy your next Aurora pump. Tracing its roots back to an ingenious inventory and a gifted investor in 1882, Layne/Verti-Line pumps are a division of Minnesota’s Pentair, Inc. With a large base in Kansas City, Layne Vertiline pumps are engineered, tested, and manufactured in a state-of-the-art facility that helps make these pumping systems resilient to the effects of time. Call us to buy a Layne-Vertiline pump that will meet your needs. Based out of its Riverview, Florida plant, Canariis takes into account efficiency and cost factors to engineer and build pumps for HVAC systems, booster systems and fire pumps. When it comes to custom pump production, Canariis sets the standard with its turnkey specialty services that cater to each individual customer’s unique needs. Look to Claypool Pump & Machinery as your St Louis pump distributor for the best in Canariis pumps. Since 1914 the Hester Bradley Company has provided a wealth of pump-related disciplines including mechanical engineering expertise, drafting, and contract installation. Focusing on delivering quality services to the mechanical and industrial/commercial markets, the Hester-Bradley Company prides itself on its reputation for the best quality products. If you’re looking for a St Louis pump distributor, you’re in the right place! While many pump manufacturers target complex industrial and/or commercial applications, Hydromatic’s two divisions cater to the residential markets as well as to global industrial markets with solids handling pumps and grinder pumps. A Pentair company, Hydromatic’s underwater waste water sump pumps and pumps that handle large solids make it a leader in its respective fields. Going back to 1959, Hydromatic’s solid approach to waste treatment pump production has created an atmosphere of continual improvement and growth in pumps for home or work. Claypool Pump & Machinery is a St Louis pump distributor for Hydromatic pumping products. A worldwide standout in industrial fields, Pentair provides in ground, above-ground, and specialty pumps. Complementing its accrued expertise and production capabilities, Pentair also produces pump accessories and utility/draining services. Moving water faster and with less noise while reducing required upkeep is a key benefit of Pentair pumps and Claypool Pump & Machinery is ready to give you the pricing and sales support for your Pentair pump so don’t delay to the premier St Louis pump distributor. For more than 100 years, this manufacturer of industrial products has introduced revolutionary changes to a diverse range of products. Originally founded as the brainchild of Harry Henderson Cutler and Edward West Hammer in 1893, Cutler-Hammer was acquired by Eaton in the late 70’s, further reinforcing its position as a pump innovator. When it comes to electric pumps and diesel fire pump controllers, look no further than Joysln Clark Controls for your fire pumps. Often used in conjunction with water/oil pumping, mining, and other industrial environments, these systems (both electric fire pumps and disiel fire pumps) deliver amazing performance thanks to their robust build. 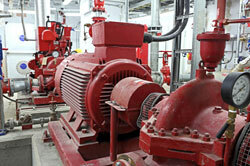 Claypool Pump & Machinery can help you select the right fire pump for your building or site. Specializing in fire protection equipment, Croker Standard has a complete portfolio of fire protection related products for commercial building needs. This ranges from host stations and accessories to fire department connections and pump test connections to test fire pump flow rates. Water – it’s the driving force behind ITT Jabsco’s water pumping solutions, well suited for the marine market. A pump for every need on the water, you can depend on Claypool Pump & Machinery as your local St Louis pump distributor to buy ITT Jabsco impeller pumps, electromagnetic clutch pumps, diaphragm pumps, pedestal pumps, circulation pumps, and more.